1. Touyinger X5 1500 lumens mini video projector, Amazing Watching Experience at home. Enjoying 2018 FIFA World Cup. 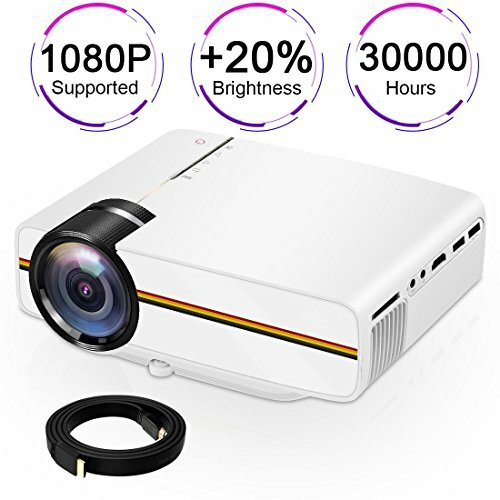 Touyinger X5 mini video projector is your best choice at a reasonable price, which has high fidelity images and focusing function. It will enhance the images to make the pictures crisp and clear through the technical processing and optimization. You can improve the focusing by adjusting the projector lens to focus on the image. 3.Why choose Touyinger X5 Portable Mini Projector? Not recommended for PPT, word, excel or business presentation. To connect Touyinger X5 mini projector with iPad or smart phone, you need a wireless display receiver. To connect the video projector with PC/ laptop, please help adjust the PC/laptop display resolution to 800*600 or 1024*768, which can provide the best clarify. Please note that it only provides clear image in dark room. MULTIMEDIA VIDEO PROJECTOR: Offering Multitude Digital Connectivity (USB/SD/AV/VGA/HDMI/3.5mm audio output), Use with Tablets and Smartphones need Wireless Display Dongle (Wireless Display Dongle not included). IMPROVED FAN COOLING SYSTEM: The Powerful Cooling Fan has reduced noise, which translates into less distraction for you when viewing movies or playing games. UPGRADED +10% LUMENS LED VIDEO PROJECTOR: The Touyinger X5 home cinema video projector takes the latest LED technology to bring you super vivid images that are 70% brighter, 30,000-hours lifespan, 800*480 native resolution with supported resolutions up to 1920*1080. This projector is ideal for home entertainment in dark, NOT RECOMMENDED for PPT or business presentations. AFTER-SALES SERVICE: 3-year warranty, you have nothing to lose by purchasing this projector. Professional customer service & technical support is available. If you have any problem or questions with your purchase, please feel free to contact us! If you have any questions about this product by Touyinger, contact us by completing and submitting the form below. If you are looking for a specif part number, please include it with your message.